The Phantom Menace marks the beginning of the Star Wars saga, telling the story of Jedi Master Qui-Gon Jinn (Liam Neeson) and his apprentice — or Padawan — Obi-Wan Kenobi (Ewan McGregor) as they attempt to safely transport Queen Padme Amidala (Natalie Portman) from the planet Naboo to the imperial planet Coruscant in order to seek a resolution to trade barriers and disputes between planets. On their travels they meet a young Anakin Skywalker, whom Qui-Gon believes to be the person who will bring balance to the Force, a power threatened by the recently resurfaced dark Sith. I really do think this film gets a bad rap. Yes, there are one or two ridiculous characters. Yes, the plot needs sharpening. But at the end of the day, this is only the introduction to the saga and more often than not introductory films are more light-hearted and carry less weight than their successors (take The Fellowship of the Ring and The Philosopher’s Stone as two obvious examples). By the same token, as I mentioned in my prequel (I told you it would get better), I have yet to see the original trilogy and my guess is that that has something to do with my somewhat greater appreciation of The Phantom Menace than those many more committed fans around the globe. What do I like about this suitably light beginning to the saga then? Well, just that. The films are likely to get darker as they progress (I know the next two do) and thus, for me, Lucas has made the correct decision in starting off in a more jaunty manner. Of course, in doing so he has created one character in particular that is despised amongst many fans. Jar Jar Binks (I always thought it was Ja Ja when I was younger) is the character in question, and I do agree that his presence is unnecessary and hurts the film to an extent. With childish phrases and at times incoherent ramblings, the character seems completely out of place — even in the light-hearted setting, which have mentioned a few times now. Do not get me wrong, childish is not always a bad trait, but in this instance it just does not mesh well enough with the rest of the film and the subject matter. Many believe the character merely represented a marketing ploy at the time of release — in terms of creating action figures etc. — and I think that is an argument worth considering. It could also be argued than the introduction of Anakin as a child here is unnecessary and that he should have just been brought into the saga as the older, talented-yet-cocky apprentice he is in Attack of the Clones. This is not as big an issue for me though and I do not think it hurts Anakin as a key character in any significant way going forward. In terms of the plot and overall story, the film does come across as convoluted at times — the political background being the main culprit here — but again, that is not a huge deal for me as events were easy enough to decipher and, in all honesty, the political background is not really a significant factor in where the entertainment in this film lies. Parts of the narrative which did baffle me though were scenes such as Qui-Gon Jinn escorting the Queen back to the ship on the outskirts of Tatooine, only to then return to the city for Anakin — why not just take Anakin at the same time and save a trip? I did actually enjoy the pod-racing sequence, but it was a tad unrealistic in the sense than Anakin consistently had enough speed in his apparently lesser pod to catch his opponents. But that is just me nit-picking at things. All in all, the story is not bad as an introductory one. Two good guys versus on bad guy? Something ain’t right here. The visuals are tremendous in The Phantom Menace. Everything from the space traversing parts to the pod-racing scene to the final battle between the Gungans and the droid army is delivered with gusto and energy, whilst being visually alert and arresting at the same time. Lucas has become a sort of pioneer in special effects due to his efforts with The Phantom Menace, making use of new technologies and computer-generated imagery combined with traditional, original filmmaking techniques to create the various visuals on screen. The action sequences are also well constructed, with the fight between Qui-Gon Jinn, Obi-Wan Kenobi and Darth Maul standing out in particular. This brings me nicely to my final topic of discussion regarding The Phantom Menace — Darth Maul. I really do think Darth Maul is an under-rated on screen villain. Played by Ray Park (a martial arts champion and stuntman beforehand), Maul not only sounds evil, but also looks like someone up to no good — his look was based on that of the devil. He does not speak very often — I would have preferred it if he did not spoken at all — and this adds to his unfaltering poise and heartless demeanour. A very capable villain to go up against the two heroes of the piece, Darth Maul is one of the film’s greatest successes in my eyes. Liam Neeson stands out amongst the remaining cast members, offering a controlled and likeable performance, and the likes of Natalie Portman and Ewan McGregor portray their respective characters solidly. Was I the only one who did not realise that Keira Knightly played Sabe, Queen Amidala’s decoy? The more you know… or something like that. So there you have it, my thoughts on The Phantom Menace. 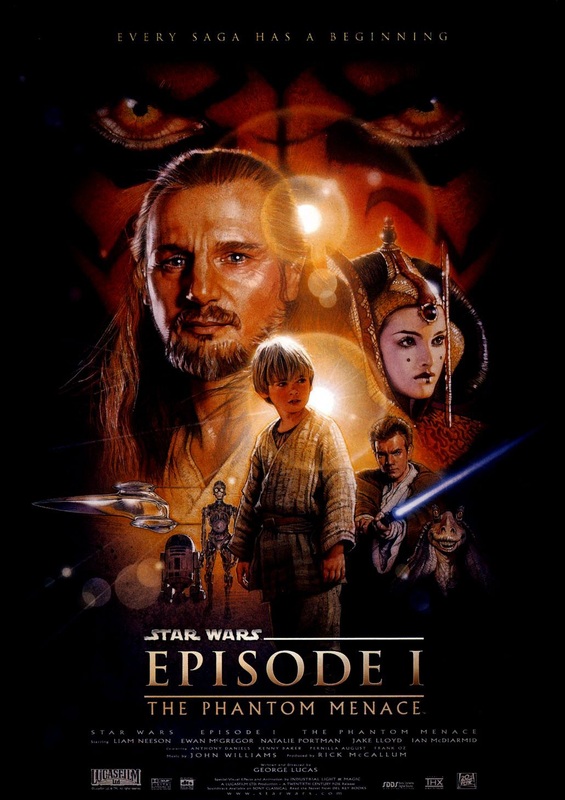 A very capable and suitably light-hearted beginning to the Star Wars saga, The Phantom Menace offers an energetic and entertaining introduction to the franchise as a whole as well as the now well-known and much-loved characters it encapsulates. Except Ja(r) Ja(r) Binks.